A Barnsley Historian's View: Too tired to Research; Why I'm tired ... and did you know it's Raining? Too tired to Research; Why I'm tired ... and did you know it's Raining? It's been a busy eight days or so and I'm frankly astonished I've held up so long. Last night my legs barely carried me up the stairs and this morning I don't want to get out of the warm, soft, bed, which has a wheely table ideally positioned for typing, reading and eating. In fact so far I've only got up to forage for food, clean my teeth and put the last but one load of washing in the tumble dryer (as the washing line outside is quite out of the question in the current monsoon). Last Sunday I attended the unveiling of the Dearne Towns War Memorial at Bolton upon Dearne Cemetery. The OH took me in the car, so actually it wasn't a very arduous day, although we did do a quick trip to the supermarket too and the ceremony in the morning had involved a lot of standing up unsupported while the OH took photos. 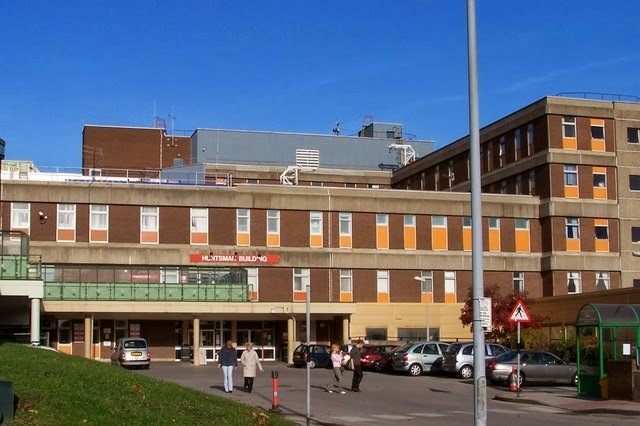 On Monday I had a hospital appointment in Sheffield (I wrote about this journey last year, it's always a doozy). It should have been four bus rides, a total of an hour and half travelling each way, but a huge hole in the 'leading up to peak hours' 265 timetable caught me out on the way home (I had just missed one and had a 50 minute wait for the next) so I added a devious move via Chapeltown and caught a train instead which actually got me back to Barnsley at about the time the 265 was due at the hospital. Still, total time out of the house exceeded five hours, and I travelled on five different buses and a train! On Tuesday I rested - well that was the theory - actually I cleaned, gardened, cooked, and typed up stories about the unveiling of war memorials. Odd how even on a rest day you still need food ... Oh and there was the upsetting discovery that my talk for the Friends of Barnsley Archives, booked by them last September, about Barnsley War Memorials (link to poster), which I am going to do on 10th November at 7pm in the Learning Lab at Experience Barnsley, had not made it into the Experience Barnsley brochure about 'The Road to War' which was launched this week. Being tired I got very emotional and the OH had to do a lot of hugging and reassuring me that I wasn't being purposely overlooked because I'm rubbish. It later transpired that it wasn't included because it attracts a charge - which is made to raise money for the Archives - all the other events listed are free. On Wednesday I was collected by a friend in his surprisingly cool car (can't say more as I don't want to a) identify the chap and b) embarrass said chap) and whisked off to Wombwell Cemetery. 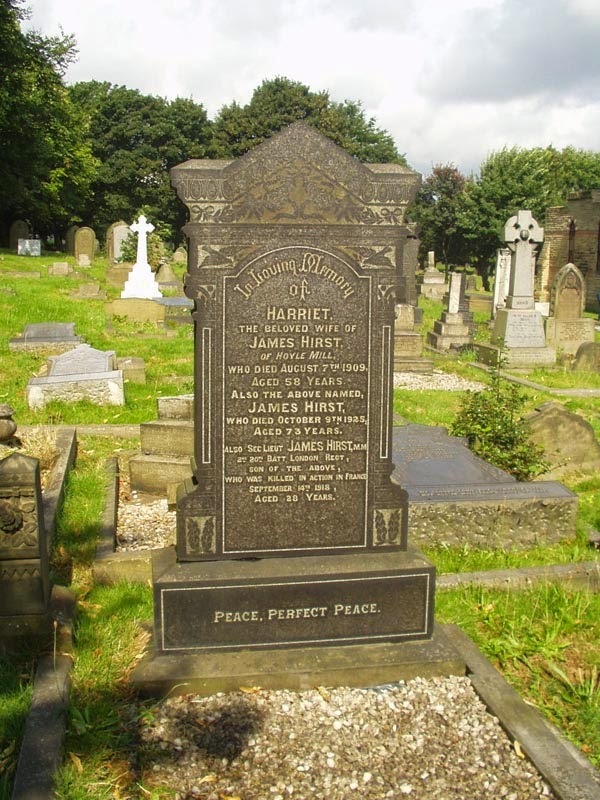 We knew the Friends of the Cemetery were 'in' on Wednesday mornings and we hoped they'd be able to help us in our search for War Memorial Gravestones. Unfortunately their priorities don't particularly match ours and although a gentleman has created a file of soldiers who are buried in the cemetery (CWGC gravestones - we aren't particularly interested in them per se) and of men from Wombwell some of whom are remembered on their family gravestones the referencing and mapping was insufficient for us to be able to go straight to the plots. So we opted for the 'walking up and down the aisles' approach. My colleague on one side of the cemetery and myself on the other. Within an hour I'd photographed 15 gravestones, 11 of them War Memorial ones and four which were probably actually burials - useful for information for our project even so. It had started to spit with rain so I went and had a sit down in the Friends' building at the Cemetery entrance and met up with a lady I know from the Archives. Back out again after twenty minutes or so I soon racked up a total of 23 War Memorials gravestones and 93 photos! That was enough for me, an hour and a half slow walking up and down, I was finished! But my colleague, who doesn't know me very well yet, was keen to continue and it was another hour or so before he was ready to take me home. I wasn't much use for anything else that day. On Thursday I visited Barnsley Archives in the Town Hall. Several of my friends and some of the Archive staff commented on how tired I looked. Fortunately searching the digitised Barnsley Chronicle is quite soothing and I always bring along my own laptop riser and wrist rest to make life easier. I managed about two and half hours, with breaks to help a visitor from Kent who was having trouble using the other copy of the Chronicle and to chat with various friends. Well, that's the other reason I go, it's a cheap way to meet people and socialise. You just have to buy some printouts (40p a sheet) and they'll let you stay for hours! There wasn't even any reason to rush home that day as the OH had left at 7am for the Great British Beer Festival without me. The first time in 22 years I haven't gone down to London for the summer. Yes, another reason I'm a bit down at the moment. But I am keeping up with events on Facebook and Twitter! On Friday I could stay in, so another rest day. I wrote up three Barnsley Soldiers Remembered stories that I'd had on file for a while. My ToDo list for the Barnsley War Memorials Project (BWMP) is horrendous. I am the Secretary and main creator of the web pages and run the Facebook and Twitter accounts too. 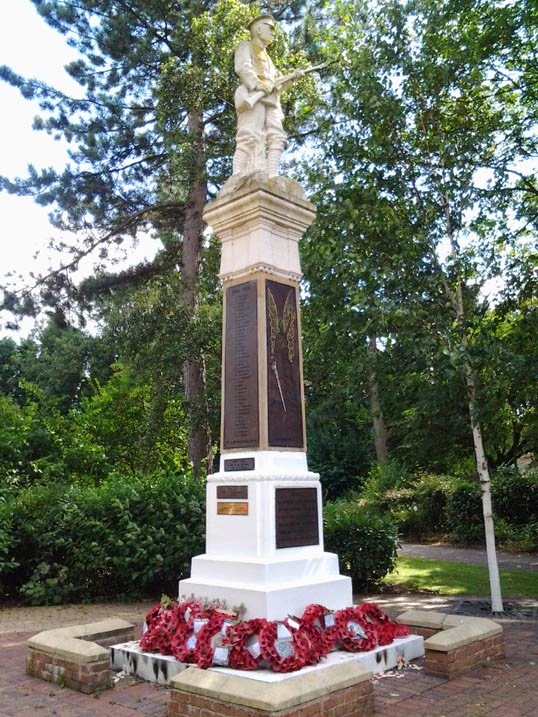 I am also researching three war memorials of my own (they do overlap a bit - that's why I'm doing three) and helping out with a couple of others (one of our researchers lives in Woking so he can't get at the Barnsley Chronicle as it's only available in Barnsley Archives). My new boots, bought with money from my Mum, arrived, and on opening turned out to be the wrong colour - since when is 'honey' anything like black? Grrr! They will have to be returned - to Germany of all places! What I didn't know was that the rain on Friday night had damaged and some said flooded, Barnsley Bus Station, to the extent that it was (and as far as I know still is) closed. When my first bus arrived in Barnsley we were all told to get off at the Railway Station. Passengers for Thurnscoe and Wombwell and other places on the south and east of Barnsley were being directed to Sheffield Road to catch onward travelling services. I don't expect you to be that familiar with Barnsley, so I'll just explain that from the Railway Station to Sheffield Road is about half a mile walk and involves either going through the undertoft of the markets (strong smell of fish) and around the multi-story carparks that they cleverly built blocking the pedestrian routes into town or by walking through the pedestrian areas and through the Alhambra shopping precinct (this route only works in the day time as when the shops are closed you can't get through the Alhambra). Either way it's a long walk and involves several slopes and sets of steps or long ramps. They had made no arrangements for the elderly or disabled. I saw one old couple head towards the taxi rank to get a ride up to Sheffield Road - but I can't afford that. I had a five minute connection for my onward 219 bus to Thurnscoe, well, of course, I missed it as it took at least ten minutes to get to Sheffield Road. Sadly if the Cudworth bus driver had told us about the bus station being closed I could have bailed out a stop early and cut through to Sheffield or Doncaster Road (slightly further along the route) avoiding the town centre altogether, but that's with the benefit of hindsight. The other people at the stop told me my next bus to Thurnscoe was the 226, I had researched this one, it takes longer to get there but at least I'd be moving. It wasn't due for another twenty minutes or so though. While I was waiting I noticed that there were no SYPTE (South Yorkshire Transport) people on the site to help travellers find the right buses, if the stop a bus was meant to visit was already occupied (and there are only two bus stops on that stretch of road) then the buses were pulling in anywhere and relying on the passengers to spot them and make their way to them. The 226 pulled in at the very bottom of the layby and an elderly lady had to be given an arm by a chap to rush there before it pulled away. I hadn't bargained on the reality of the actual length of time it was going to take to get to my destination via this route - over an hour! Good job I'd prepared by eating and drinking nothing since 5am. With a tour of Wombwell (wave to War Memorial on the way past), Cortonwood (wave at War Memorial), Wath upon Dearne (out of area for us but wave to War Memorial all the same), Bolton upon Dearne (ooh, already been here this week, wave at both War Memorials), Goldthorpe (nope, haven't a clue where the church, library or Working Men's Club are relative to my position so no waving possible) and finally Thurnscoe, I arrived at the Rainbow Centre two hours and fifteen minutes after I'd left home! 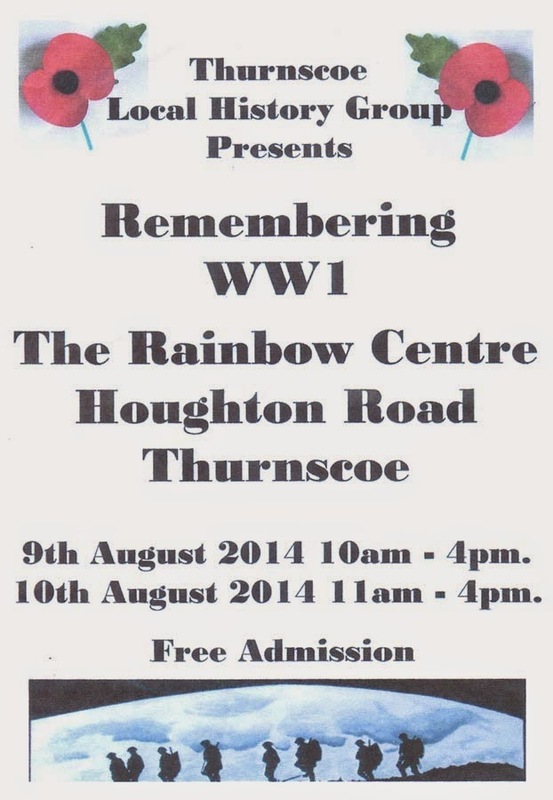 Thurnscoe's War Memorial - I've seen it! The display was great and the man I had arranged to meet very friendly. He has agreed to allow BWMP to use his photos of church windows and other hard to access and hard to photograph memorials. Result! and very grateful thanks! I was directed to the Thurnscoe War Memorial, well I couldn't go all the way there and not visit could I? Photo on left. I had been given some helpful advice about buses too and decided to try the alternative route that Travel South Yorkshire had suggested in order to avoid Barnsley town centre on the way home. This involved a bus to Great Houghton and a change to another bus direct to Cudworth where I live. Looks sensible on the map ... Ha! The 219 (which does go all the way to Barnsley, but that wasn't my plan) turned up on time and I asked the driver where was best to get off in Great Houghton - another place I'd only ever been driven through by the OH before. I really didn't comprehend the complexity of the apparently simple task of changing buses in the village. The 219 driver helpfully told me that the 26 (the bus to Cudworth via ATOS and Grimethorpe) would stop any of the stops in the village where he stopped. So I got off near the church, well you never know I might have time for a look around. Hmm, a quick look at the timetable on the bus stop showed I'd missed the connection by about five minutes and the 26s were only once an hour. I went and had a look at the church as there was no seat in the bus stop. It was shut, of course, but I sort of waved at the War Memorial which I would like to see in real life one day. Photo on the BWMP web page by the chap I'd been talking to in Thurnscoe incidently. I carried on walking, in search of a bus stop with seat nearby if not at the stop, past the chapel (closed, of course, but wave at War Memorials anyway) and on down to the Miners' Welfare Hall which has a War Memorial but the BWMP hasn't got a photo good enough for a transcription yet, so another one I'd like to see in person one day. There were seats outside the hall and a bus stop just beyond the grounds so I waited and tried to read the Barnsley Chronicle I'd bought in Thurnscoe in the rather gusty winds. I and some others are not particularly happy about the plan of a Barnsley councillor, Joe Hayward, and Dan Jarvis, one of our MPs, to campaign for a new memorial to the Barnsley Pals in France. Yes, the Pals lost lots of men there, but what about the rest of Barnsley's casualties, the other 4000 Fallen and the thousands of men who came home wounded and traumatised. Finally on the right bus, after a couple of false alarms, and the bus filling up to standing room only with people wearing red polo shirts at ATOS (must have been shift change) I eventually got home at about 4pm. I'd left at 10.15am. So another long day, and a lot of walking. I would have gone straight to bed, except I'd stripped it for washing that morning, so I had to get the hoover out (I'm allergic to dust mites along with everything else so the bed has to be hoovered every week!) and put on the new bedding. Sooooo tired! 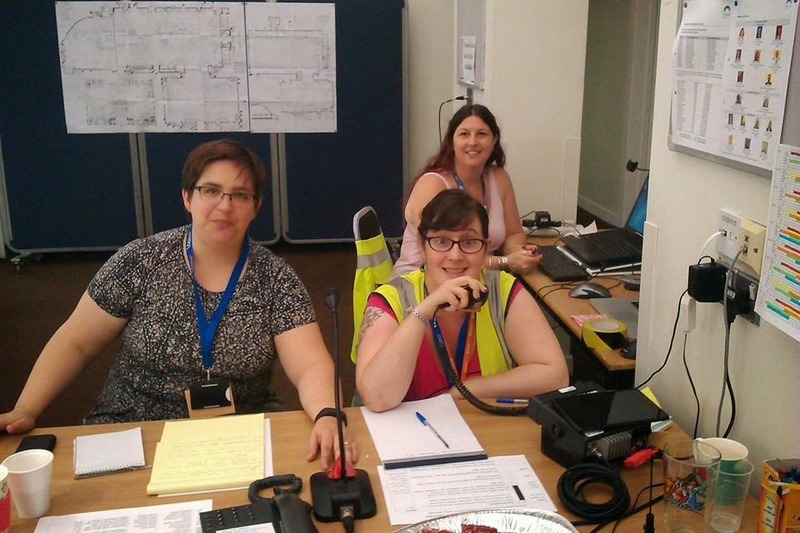 But to cheer me up my daughter had posted some pics on Facebook of the Great British Beer Festival Organiser's Office team working well without me. Kinda wish I was there for the friends and a bit of beer, and having seen the pics on Facebook this morning of the rain and the puddles they've got in Olympia, oddly missing it even more as it will be exciting down there today. Well that was my week - and I might get up in a while, maybe after lunch - or then again I might not, after all you can watch tv on the internet these days from the comfort of your bed! And I have soooo many War Memorial photos to catch up on!